​We invite the friends and family of MAJ Kyle Petroskey to honor Kyle’s memory on the morning of August 5th by doing what Kyle loved – swimming. Major Kyle Petroskey was an Army Swimmer at heart. He relished his time as Captain of the Men’s Army Swimming and Diving Team. 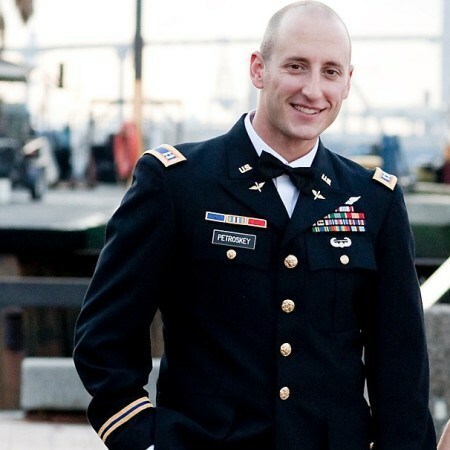 Kyle served in the military as an Army Blackhawk Pilot, but not just an average pilot. He was one of the best Army Aviators of his time. Kyle graduated from West Point in 2001 to pursue a career in Aviation. He deployed to Iraq and Afghanistan and commanded VIP operations out of Bagram Air Base; he led missions for Special Ops, Media, General Petraeus, Secretary Gates, General Casey, and the list goes on. Kyle then went on to be accepted into the United States Naval Test Pilot School (USNTPS). Less than a week before he was scheduled to graduate, Kyle and Jamie were informed he had stage four cancer of the Trachea; extremely rare and aggressive. He should have only been with us for six months, but after a very hard three-year battle, cancer took our humble soldier on April 2, 2015. Everyone at Walter Reed worked hard day and night to keep Kyle going and alive. He fought everyday to be with us, to stay here. He was and will always be loved by all who crossed his path. Before his Army career, Kyle displayed his athletic and leadership abilities through competitive swimming. Kyle rose to the challenge of the event most swimmers couldn’t handle – The MILE. Kyle’s swimming career culminated as a member of the Army Men’s swim team, where he was voted by his peers to serve as Team Captain his senior year at West Point. Competitive swimming helped to mold Kyle’s character, leadership and strong will. Throughout Kyle’s battle with cancer, he always held onto the desire to get back in the pool. On the morning of Kyle’s funeral, former members of the Army Men’s and Women’s swim team will conduct a “swim to remember” event at the Zembiec pool located at Henderson Hall. You do not have to be a swimmer to participate, there is no speed or distance to this event, just a group honoring our lost loved one. Henderson Hall is located adjacent to Arlington National Cemetery and the swim will set the tone for the events of the day as we celebrate Kyle’s life and friendship. After the swim we will have breakfast at the pool and then move to the cemetery. Please support this event and the memory of Kyle in any way possible. The funds raised through this event will go towards a memorial to honor Kyle’s legacy at Crandall Pool, West Point. Any remaining funds will support the Army swim team, as Kyle wished. The event is scheduled to support the funeral activities on August 5th. Friends and family of MAJ Kyle Petroskey will honor Kyle’s memory the morning of August 5th while doing what Kyle loved – swimming.